I’m sure there is absolutely no doubt that you have all at least heard of, are already extremely familiar with or perhaps even are in love with this particular one! And I’m sure many of you have this also in your own children’s book collections. 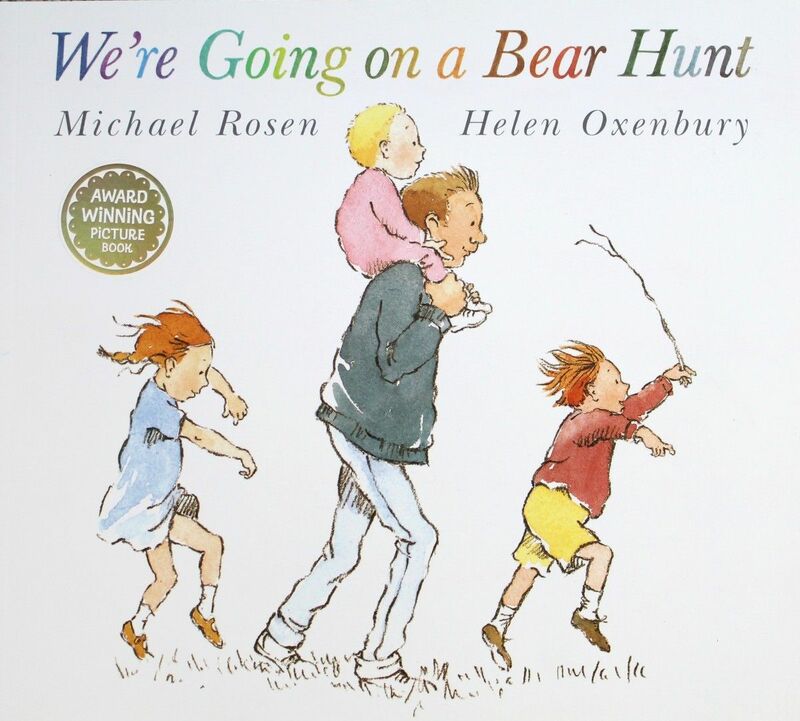 Winner of the ‘Smarties Book Prize in 1989’, the story, written by Michael Rosen and beautifully illustrated by Helen Rosen, has expanded on the old rhyme ‘We’re Going on a bear Hunt’ which personally I remember learning and rhyming along to as a Brownie or a Girl Guide way back when I was younger (and probably with a mullet!) in the 80’s. The tale tells of a fabulous family adventure where together, they go off over hills and though dales in search of a bear, all the while encountering obstacles along the way. The story follows the rhyme very closely indeed, with each section of the story elaborating on each verse with beautiful water-coloured drawings providing a visual element to the original rhyme. Each verse illustrates a different obstacle that the family must face and overcome in order to carry on their journey. These words and expressions are fabulous to exaggerate and emphasise even further to illustrate the situation and to really take your little ones on a gripping sensory journey, making it all the more interesting and exciting for your children and you too as you read the book together. This is also where I like to add a few hand actions too – just to be true to my roots! Which also – the kids love to learn, join in with or just giggle at! The repetitive verses of the story are just perfect for your little children, as they can become familiar with them as you read, and encourage them to join in too. Having read the book I also think this would make a fabulous summertime adventure activity for a group of children. Can you imagine the fun you would have as you led them on a real-life journey through such obstacles for a party with a bit of a difference? I especially love the way the story has two parts to it. 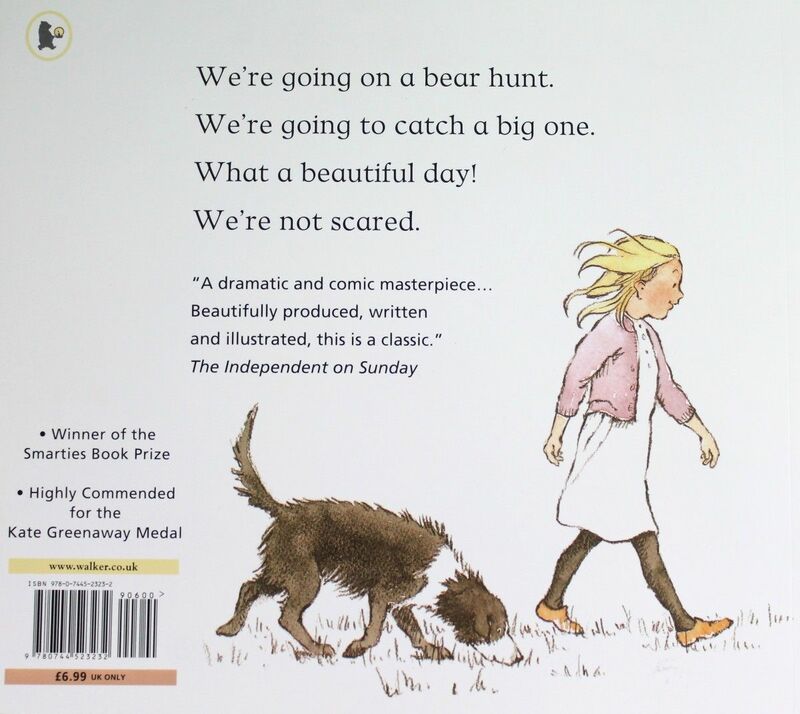 Firstly it tells of the family as they travel to find the bear, ambling steadily along, taking their time to cross each of the obstacles in their path, excited yet apprehensive at whether they may in fact find a bear; and then the second part, once they’ve found the bear! The tale picks up pace dramatically as they all have to run back, rushing quickly through the obstacles, in panic back to the safety of their home! We often get confused and mess up the words here a little, but only because we too are running as fast as our little legs can carry us, alongside the family as they run for their lives!!! It’s as if we’re in the story ourselves, which is superb as it just adds to the exhilaration of the chase! It’s a fabulous story to read aloud, for the children to join in with, to act out and to learn and read themselves as they grow older. And as I said before – I’m sure you’re all already familiar with it – but if not – I would thoroughly recommend a read! Not forgetting the small things…..